Active Savings Accounts: Savings accounts that require accountholders to complete certain prerequisites such as crediting of salary or credit card spending in order to receive higher interest. Passive Savings Accounts: Savings accounts that does not require accountholders to complete certain prerequisites to receive interest. Generally have lower interest compared to active savings accounts. With the proliferation of savings accounts offered by various financial institutions, It's no wonder that we are often indecisive and paralyzed by an overload of options. In this post, we will examine 6 active savings accounts, as well as to find out the best combination to earn the highest interest on your savings. For ease of drawing parallel, I have cast aside the onerous hurdles for insurance/loan/unit trust and only assume the standard tasks of credit card spend, salary crediting and bill payment. For the uninitiated who intend to prepare for the worst case scenario after the Banking Collapse of 2008, you will be relieved to know that all bank deposits in Singapore are protected up to a maximum of $50,000 per person per insured bank. Established in 2006, the deposit insurance scheme initially provides compensation to individuals for the first $20,000 of their deposits in the event that the bank fails. The deposit insurance coverage limit was subsequently raised to $50,000 in 2011 and have remained so since. Just 2 weeks ago, MAS has finalised the proposed enhancements to increase the deposit insurance coverage to $75,000 per depositor following from public consultations in 2017. The current intention is to effect the enhancement on 1 April 2019. This is one of my favourite savings accounts, primarily because it does not impose a minimum salary crediting or credit card spend as long as the total eligible transaction amount falls within one of the transaction tiers. This is especially useful for someone like me who does not consistently spend at least $500 on my credit card every month. 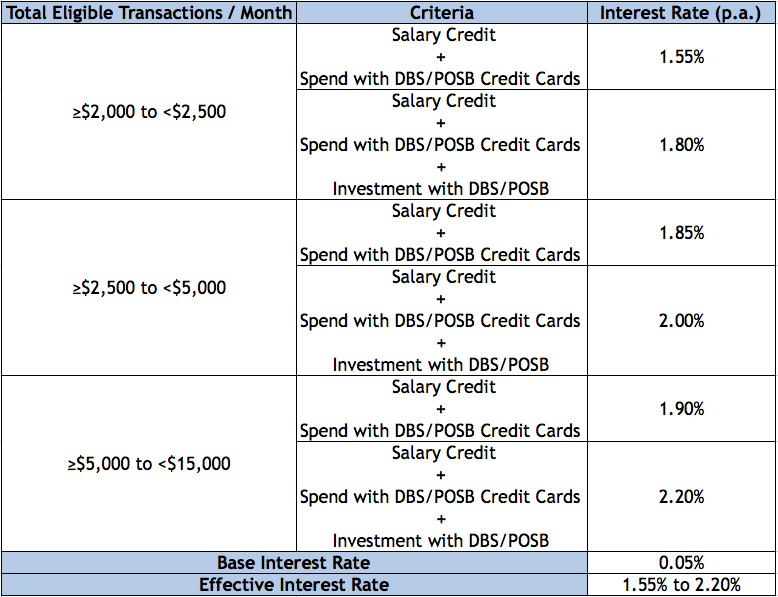 So if you have a salary credit of at least $2,500, you can spend a minimum of $1 on your DBS/POSB Credit Card to obtain 1.85% interest. The bonus interest rate applies to the first $50,000 account balance. The reason I have included the investment condition for this savings account is because it is relatively undemanding to accomplish. One way to satisfy the criteria is to credit dividend from CDP to the DBS Multiplier Account or any personal DBS/POSB deposit account. To satisfy this requirement, you may consider subscribing to the Singapore Savings Bonds ("SSB") which I have talked about it in my previous post. It is crucial to link the CDP to any personal DBS/POSB deposit account in order for the crediting of dividend to take place. As the SSB pays out interest every 6 months for the next 10 years, you may choose to subscribe to 6 consecutive SSB issues to qualify for the investment condition for the whole year. The minimum sum to invest in SSB is $500 which comes with a one-time fee of $2. Another method is to set up an additional joint DBS account (Not a DBS Multiplier Account) with your spouse and credit the dividend to the joint account. That way your spouse and you will be able to enjoy the bonus interest from the investment category for each individual and separate Multiplier accounts. Personally, I think this savings account is structured uniquely in which the bonus interest is based upon the mandatory requirement of credit card spending. The secondary requirement can be either the crediting of salary or the payment of 3 bills via GIRO. The bonus interest rate applies to the first $50,000 account balance which is broken down into 3 different tiers. The effective interest rate across $50,000 is approximately 2.43% assuming that both the primary and secondary prerequisites have been met. Does not strictly require the crediting of salary. May be suitable for self-employed. This is the savings account which I have set up straight after I have secured my first job in 2014. It used to be a must-have active savings account until the bonus interest rate was revised twice in May 2015 and April 2017 separately. In spite of that, it still remains a relatively competitive savings account, especially for its salary crediting criteria. The bonus interest rate applies to the first $70,000 account balance. The minimum total bill payment of $150 can be easily achieved by paying for your OCBC credit card bill if you are already spending at least $500 on it. Currently, there is an ongoing SAVE promotion from 2 Apr to 30 Jun to earn an additional 1% interest on the incremental balance between the previous and current month's average daily balance. Unless you are transfering a large sum in and out of the account on alternate months, the interest earned on the incremental balance might be insignificant. This is a savings plan for BOC Multi-Currency Savings account holders to enjoy the higher interest rate. At first glance, this savings plan seems to appeal to higher income earners/higher spenders as they have separate categories for salary crediting of $6,000 and above, as well as monthly credit card spend of $1,500 and above with correspondingly higher interest rate. There is also an extra bonus interest of 1% for account balance above $60,000 if one of the prerequisites as listed below has been fulfilled. Nevertheless, at an effective interest rate of 1.95% for the average working adult, BOC SmartSaver is still a force to be reckoned with. The bonus interest rate applies to the first $60,000 account balance. An additional interesting feature is that the savings plan allocates different base interest rate tier based on the account balance. 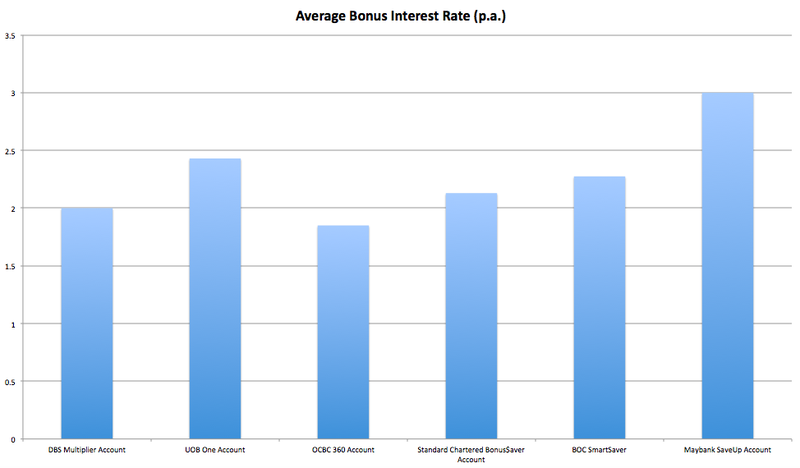 At a range of 0.25% to 0.4%, BOC SmartSaver boasts higher base interest rate than the other savings accounts. 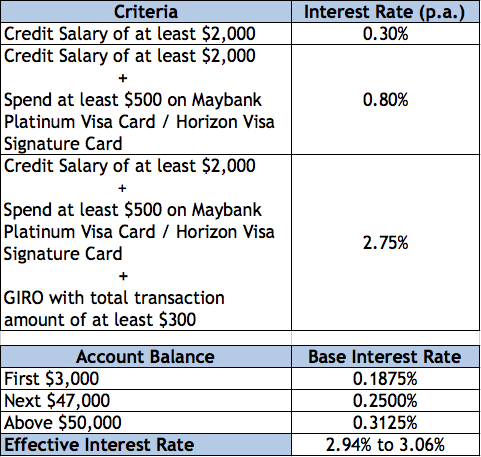 Depending on the account balance, the effective interest rate may vary between 2.2% and 2.35%. One salient feature of this savings account is probably the higher salary crediting requirement. To qualify for the criteria, you have to credit a salary of at least $3,000. If we were to factor in the 20% CPF contribution, you will need to be earning gross income of at least $3,750/month. Similar to BOC SmartSaver, this savings account also have a separate category for monthly credit card spend of $2,000 and above with correspondingly higher interest rate at 1.78%. There is another downside to it as you have to charge your spending to BonusSaver World MasterCard credit/debit card which does not appear to earn any additional cashback/rewards. This definitely pales in comparison to the alluring benefits offered by the prized SCB Unlimited Cashback Card. Furthermore, the bill payments condition also appears to be trickier to meet as it requires 3 bill payments of at least $50 each. Overall, the bonus interest rate applies to the first $100,000 account balance. One unique feature about this savings account is that it presents 9 categories of products/services from which you can complete up to 3 requirements in order to earn the bonus interest. Most of the other categories involve loan, insurance or unit trust which I have omitted from the table below. The bonus interest rate applies to the first $60,000 account balance. Interestingly, there is a huge jump of almost 2% bonus interest between the fulfillment of 2 and 3 conditions. Personally, I find it a little demanding to have a GIRO payment of $300, on top of the $500 monthly credit card spend. Similar to UOB One Account, Maybank SaveUp Account also offers different base interest rate at different tier of account balance. 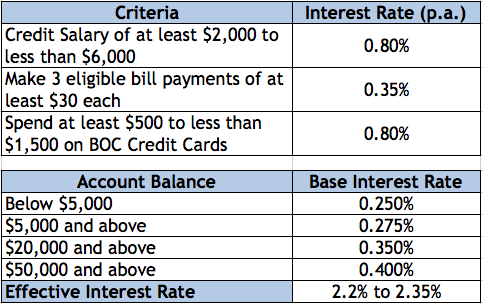 If you are able to complete 3 criteria, you will earn an effective interest rate of approximately 2.94% to 3.06%. In the event that only 2 prerequisites are met, the effective interest rate will drop to 0.99% - 1.11%. Therefore, this savings account will only be worthwhile to have if you are very confident of completing 3 requirements. More information on the other 6 categories can be found here. The GIRO condition imposes a relatively strict requirement of a total transaction amount of at least $300 which can be rather difficult to fulfill. Mayank is one of the participating banks in the atm5 shared network. The ATMs are not as commonly found compared to that of the local banks. If we were to zero in on the maximum amount of account balance for which the bonus interest is accorded, Standard Chartered Bonus$aver Account leads the pack at $100,000, followed by OCBC 360 Account at $70,000. BOC SmartSaver and Maybank Saveup Account tied for the third place at $60,000. To get the best bang for the buck, Maybank SaveUp Account offers the highest bonus interest rate at approximately 3%. However, this comes with the taxing requirement of at least $300 GIRO payment or the qualification of any of the other 6 products/services. 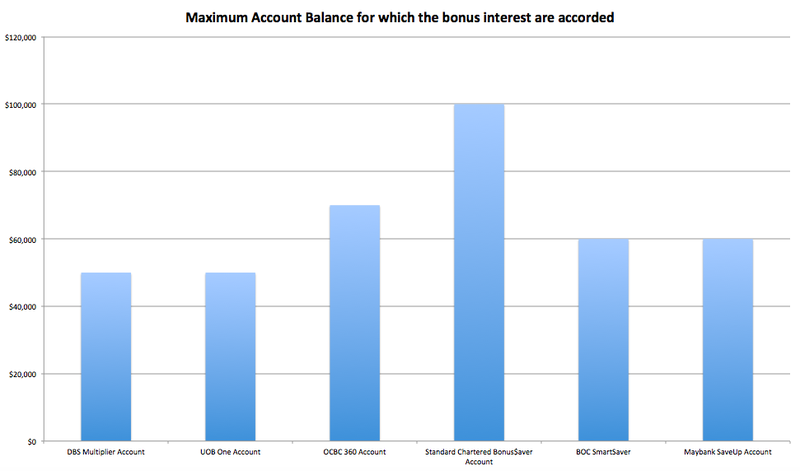 The runner-up is UOB One Account at 2.43% with more relaxed criteria. My personal favourite is DBS Multiplier due to its flexibility around the credit card spending requirement. The usual criteria can be split between 2 accounts, namely the DBS Multiplier Account and UOB One Account. The salary should be credited to DBS Multiplier Account, along with spending of minimum $1 on DBS/POSB Credit card and the SSB subscription which I have outlined above. This should yield 2% interest on your first $50,000. 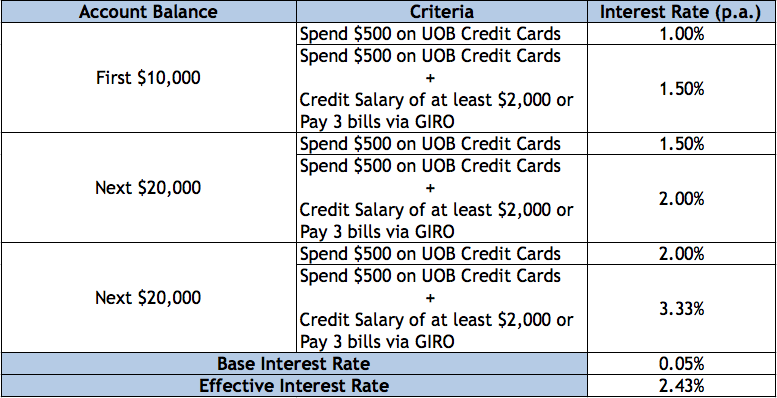 The $500 credit card spending can be reserved for UOB One Account, along with the setting up of 3 GIRO debit transactions (eg. credit card, mobile bill, etc). This will produce an average of 2.43% interest on your first $50,000. Overall, with this combination, you should be earning approximately 2.22% on your $100,000 balance. All in all, the purpose of this post is to provide a comparison across the active savings accounts that are on the market. Whatever works for me might not work the same for you. 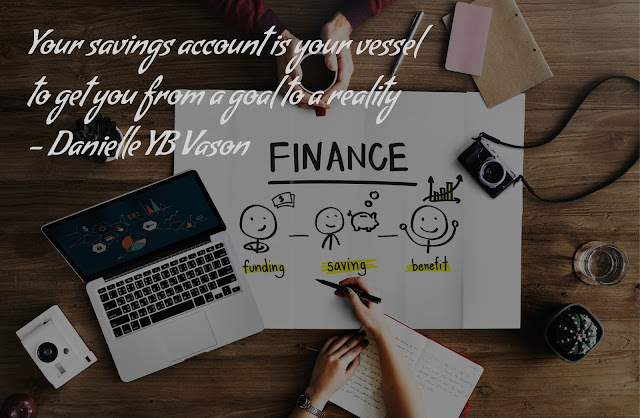 Therefore, it is imperative that you select the best possible savings account based on your savings needs, as well as spending and earning pattern. The following post explores the series of passive savings accounts that do not require you to complete the burdensome hurdles of salary crediting or credit card spending. I have also added on a passive savings account to the combo so as to fully utilise the bonus interest rate. i used to have the same combo as you. but i have switch to POSB Cashback Bonus + UOB One. Was giving me abt $150 monthly. Thanks for sharing! I would probably only qualify only 2 out of 5 categories for POSB Cashback Bonus since I do not have home loan, insurance, unit trust or RSP with them. It largely depend on individual's savings needs, as well as spending and earning pattern.